Did you know that each winter one septillion (1,000,000,000,000,000,000,000,000) of snow crystals drop from the sky and that it takes about a million little droplets to make one snowflake? As common as it might seem at first glance, snow is actually a very complex type of precipitation. If you are wondering which is the world’s largest snowflake or what is the record for the greatest snowfall in the United States, you have landed on right page. Not all snow is the same and who knows this better than skiers and snowboarders? Skiers created in the early 1900s their own terminology to describe various types of snow. The crazy lingo used by them includes funny terms such as “pow pow,” “mashed potatoes,” “champagne snow (powder),” “cauliflower,” “sticky snow,” “dust on crust” and many other descriptive terms. Slang adds humor, color and personality to any vocabulary. Did you know that “pow pow” or simply pow (from powder) is the fresh powder snow, which is actually a soft, fluffy type of snow? “Champagne snow” has such an extremely low moisture content that you can’t even make a snowball with it. While “champagne powder” is great for skiing because it’s smooth and dry, “mashed potatoes” is an old, dense and heavy snow that is hard to turn skis in. According to specialists, “snowflakes are agglomerates of many frozen ice crystals., most snowflakes are less than one-half inch across”, NSIDC. The water content of snowflakes is more variable than we think. An average snowflake is made up of 180 billion molecules of water, but the snow-water ration depends on various factors such as temperature, crystal structure, wind speed etc. Even if there aren’t any images of the biggest snowflake ever recorded, the Guinness Book of World Records states that a giant snowflake was found at Fort Keogh, Montana on January 28, 1887. It was 15 inches wide and 8 inches thick. Cold-tolerant algae are small, photosynthetic organisms which grow on snow and ice in the polar and alpine regions. Different strains of algae can color the snow yellow, red, orange, brown, green. Of course, the snow acquires its color after it has fallen. You may see snow that falls pink, brown, orange or red, if the air is filled with dust, pollutants or sand. Orange snow fell over Siberia in 2007 and Krasnodar (Russia) was covered by pink snow in 2010. If you ever wondered where did the most snow fall in one year, here is the answer. Mount Baker, in the North Cascades of Washington State, holds this amazing world record, a reported 1,140 inches accumulated during the 1998-99 snowfall season. It is the youngest volcano of the Mount Baker volcanic region and the most heavily glaciated of the inhospitable Cascade volcanoes. Mount Baker (10,775 feet) is for sure one of the snowiest places on earth. The greatest amount of snow to fall within 24 hours in U.S. occurred in Silver Lake – Colorado in 1921: 76 inches of snow. Another impressive record of 63 inches was registered in Georgetown, Colorado on December 4, 1913. It can never be to cold to snow. Actually, it can snow even at incredibly low temperatures “as long as there is some source of moisture and some way to lift or cool the air.” (National Snow and Ice Data Center). However, major snowfalls occur in relatively warm temperature climates. If you are curious to know how much snow falls where you live, check out the Snowfall Table provided by the National Climatic Data Center. Constructed each January on ice and snow, the ‘Wapusk Trail’ road has a length of 467 miles and links Gillam, Manitoba with Peawanuk, Ontario, Canada. ‘Wapusk Trail’ is the longest seasonal winter road in the world. It even got a Guinness World Records certificate. This type of ‘temporary highways’ have a crucial role in enabling goods to be delivered to communities without permanent road access. Warm weather forces the closure of the winter road staring with March, early April. Air transportation is an alternative, but it’s quite expensive. Did you know that a single snowstorm can drop more than 39 million tons of snow, carrying the energy equivalent to 120 atomic bombs? ‘The Great Blizzard of 1888’ was one of the most devastating snowstorms to hit New Jersey, New York, Massachusetts and Connecticut. The storm dumped up to 50 inches of snow. ‘The Great Snow of 1717’, ‘The Washington and Jefferson Snowstorm’, ‘The Long Storm of November 1798’ and the ‘Portland Storm’ are other major snowstorms that struck America. Dutch daredevil Wim Hof holds the world record for running the fastest half marathon barefoot on snow and ice. He completed the marathon in 2 hr 16 min 34 sec near Oulu, Finland, on 26 January 2007. Hof’s stunning abilities to withstand harsh winds, snow, ice and freezing temperatures won him the nickname ‘Ice Man’. By courageously swimming 80 meters under the North Pole ice, Wim Hof earned another Guinness World Record. 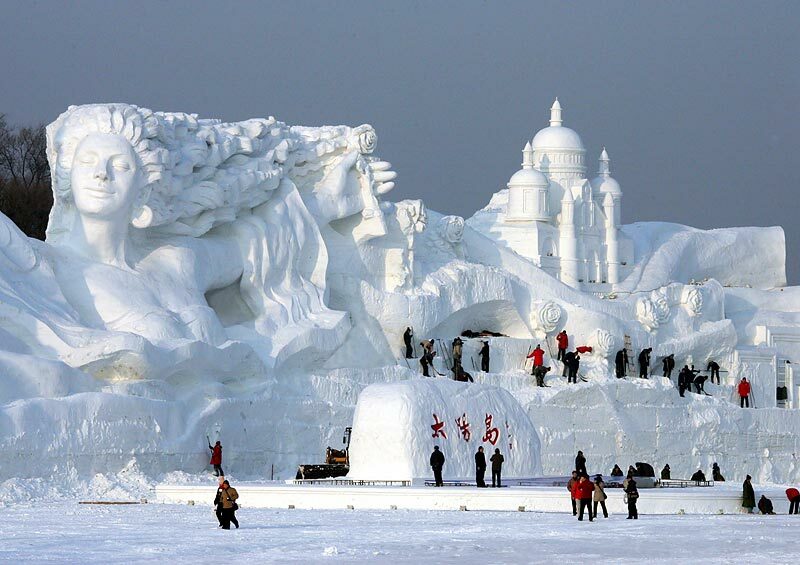 A team of 600 amazing sculptors unveiled at the Harbin International Ice and Snow Sculpture Festival held on December 20, 2007 – ‘Romantic Feelings’ – the world’s largest snow sculpture. The Olympic Games were the source of inspiration for the staggering 656 ft long and 115 ft tall sculpture. This magnificent ‘landscape’ was the centerpiece of the festival opened in the Heilongjiang Province, one of China’s coldest places. Throughout time, snowflakes have fascinated many eminent scientists and philosophers such as René Descartes, Johannes Kepler and Robert Hooke, but the man who literally devoted his entire life to showing us the diversity and beauty of snowflakes is American Wilson A. Bentley (February 9, 1865 – December 23, 1931). This ‘snowtastic’ Top 10 list is a tribute to Wilson Bentley, the first man to capture snow crystals on film. Known as “The Snowflake Man”, Bentley captured more than 5000 photographs of snowflakes. He received international acclaim in the 19th century for his pioneering work in the fields of photomicrography, because he perfected a process of photographing snowflakes before they either melted or sublimed. Bentley’s legacy is an extraordinarily rich one: a vast library of detailed journals, books, published articles and over 5000 photographs of “tiny miracles of beauty”, as he often referred to snowflakes.